Town boss Jamie Fullarton said his side were “excellent in every aspect” in their impressive 2-0 win at home to title-chasers Solihull Moors. Solihull came into the match with more National League wins than any other team, but Town produced a superb display to move them onto 50 points for the season - and 12 above the relegation zone. Goals in each half by loanees Manny Duku and Devante Rodney sealed the win for Halifax, while Lee Vaughan was sent-off for Solihull just before half-time. “To see players respond again to a subtle change of shape, with a different onus on certain tactical aspects, and for that to bear fruit, is really pleasing, and I think well-merited over the 95 minutes,” said Fullarton. “I think the performance was excellent in every aspect, against a team that’s second in the league. Fullarton put the impressive performance from his side down to their work on the training pitch. “If this was out of the blue, and a one-off, then we can put our finger on it, but why were we so good today? Because of the hard work we do every day of every week over a period of time,” he said. “There is a level of consistency (in that). I think they responded really well to what was asked of them, that was worked on, against a team that’s difficult to play against. “I think they matched that, coped really well with it, and then when we picked up those second balls, there was a real clarity in what we were trying to do. “We created some gilt-edged chances, from exciting play, intricate play, and sometimes just understanding when you do play and when you don’t. “It was a real mixed bag. Because of the intensity, tempo and style that Solihull, I thought it added to the spectacle. “Let’s not detract from the result and the performance. I thought we were probably better 11 v 11. “We started fast out of the traps. I thought they had a gilt-edged chance themselves with Gudger’s header that he’ll be disappointed. “Then we had a number of one v one’s and chances that could have put the game out of sight before half-time. Fullarton sang the praises of strikers Duku and Rodney, who were a constant thorn in Solihull’s side all afternoon. “When you have competition for places it increases level of performance,” said the Town boss. “I touched on it before and after the Havant game where, due to injuries and suspensions, we didn’t have forward options off the bench. “When you do, in attacking areas, it means you get performances like we have. “Both players, along with the other forward players, have contributed. Fullarton praised the contribution of Duku and Rodney on and off the ball, which he felt was reflected by the rest of the Town team. “They deserve credit for taking on board what’s being asked of them, and the group embracing them and helping them,” Fullarton said. “It’s relentless on the training field, and they’ve responded excellently. “Although attacking players are judged on goals, we try to look beyond that, and their impact along with the other forward players. “With and without the ball, I thought we applied the game-plan probably as well as we have all season, and it’s a merited result. “I don’t want to cloud anything from the performance or the result because of them going down to 10 men, because before that, I thought we were better. “I thought we coped as well as anybody has (against Solihull). It’s the fourth time this season we have coped well with it. “I touched on it during the week. We were wanting a similar performance to those three other games, but three points. When asked if the result was even more satisfying coming against a team challenging for the league title, Fullarton said: “Other people from outside would look at it as a more satisfying result and performance. But it’s three points. “We play Ebbsfleet on Tuesday, and Maidenhead on Saturday, and I’ll be as delighted with three points on those days as I am today. On Town’s alteration in system, Fullarton said: “We had a subtle change in shape, with a four, three-and-a-half, two-and-a-half. “The players picked it up quickly, grasped how we were trying to play and how our principles fitted to that. “It’s them that take the credit for that. We’ve worked hard on that this week. 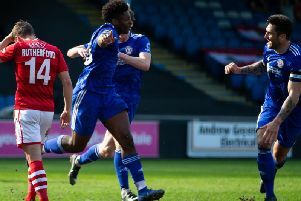 Josh Staunton made his first start since December 8, and his performance impressed Fullarton, who added: “Again, competition for places, identifying how we’re going to play, and the opposition. “That’s the advantage of having a strong squad, you make a change and it adds value. “No doubt when you make substitutions or changes, people question it. “But when you have a squad, you can be a manager and pick a team, rather than the team pick itself.